It’s after Labor Day and you know what that means…the beginning of pumpkin season! I have been so excited for Fall recipes. Now that football is here and temperatures are just starting to drop I have apple, pumpkin, cinnamon and squash on the brain! I was planning for my first Fall recipe to be my mom’s Butternut Squash Soup, but as those of you who follow me on Facebook already know, I messed that up and have to remake it. Oops. Get your spoons ready though, because it’s coming soon! 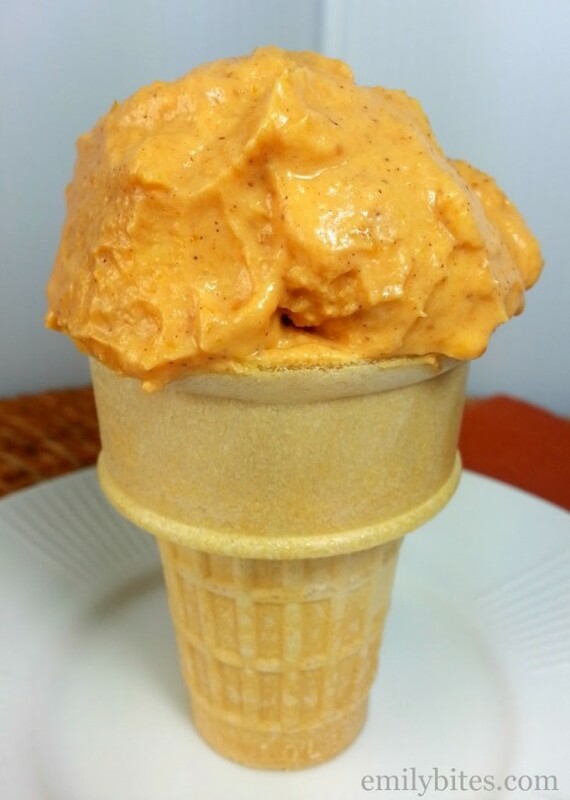 I decided this Pumpkin Pie Frozen Yogurt was actually the perfect recipe for this time of year because it combines an end of Summer frozen treat with rich Fall pumpkin flavor. This frozen yogurt really captures the flavors of pumpkin pie filling, and it’s hard to believe ½ cup is only 89 calories or 3 WW SmartPoints! I absolutely recommend the ice cream machine I have. I use a Cuisinart model and it’s so fast and easy to use. You simply keep the machine’s bowl in your freezer and whenever you want to make ice cream, frozen yogurt or sorbet you mix up the ingredients, put the bowl on the machine, start it up, pour in mixture and in less than 20 minutes you have ice cream! No rock salt or ice required. Combine all the ingredients in a large bowl and stir until thoroughly mixed. Put the entire mixture into an ice cream freezer/maker and freeze according to manufacturer’s instructions. Freeze any leftovers in an airtight container. Can’t wait to make this with my kitchenaid ice cream attachment! It would definitely be easy to double or triple this recipe. Hope you love it! Looks deelish…sadly, I have no icecream maker….but just might mix it up and freeze it and see what happens. Thanks so much! Let me know if that works out! Perfect combo of summer and fall…I live in VA now (but miss the Blo) and fall still feels a bit like summer to me! I loved it. Husband thought it was too “yogurty”, so I might try a flavored greek yogurt next time. Did you use vanilla flavored? Sorry your husband didn’t love it (he’s probably more of an ice cream guy than a frozen yogurt fan) but I’m glad you loved it! This sounds so yummy! Thanks! Hope you love it Charlene! oh my goodness!! this looks AMAZING! i LOVE anything and everything pumpkin! Can this be made in any way without an ice cream maker? I do have a Blendtec…can this be adapted for that? I have no idea what a blendtec is, so I can’t really speak to that! I only made it in an ice cream make but you can certainly try it another way. Let me know how it works out! This sounds amazing Emily! Do you know… can you substitute anything healthy for the Greek yogurt in this recipe? It can give me migraines sometimes. Thanks 🙂 I didn’t know if there was a different healthy alternative 🙂 I love your stuff!! I’m sorry to hear that…it doesn’t sound like you used an ice cream maker and I have never tried it without one so I can’t speak to the solid mass problem. I used Wegmans brand vanilla Greek yogurt. I have personally never been a Chobani fan, I prefer Fage. I just don’t like the flavor or consistency of Chobani, but a lot of people do. I think the Wegmans yogurt is closest to Oikos brand. Sorry you didn’t like it! Greek yogurt does have somewhat of a naturally tart taste to it, but I found this recipe to be plenty sweet. Hi Emily, First, thank you for your recipes–this site is such a great resource to me! Second, I wanted to let you know that I made this without an ice cream maker. I just put it in a 3 cup Rubbermaid container. After about 3 hours, it was all set, but I mixed it all up and it was a nice, though soft, consistency. When I checked again after 5.5 hours, there were some ice crystals, but I mixed it up and it still tasted good. I am not sure if more ice crystals will continue to form, but so far so good. This recipe is a keeper. So simple and yummy! Thanks again. Emily, thank you for sharing this wonderful recipe. I’m a caterer and I have to tell you that this one is definitely a “must make”. Talk about sounding super-duper good… oh baby, I cannot wait until this weekend; to get into the kitchen, make it, and TRY IT! Yummy! Great website!! 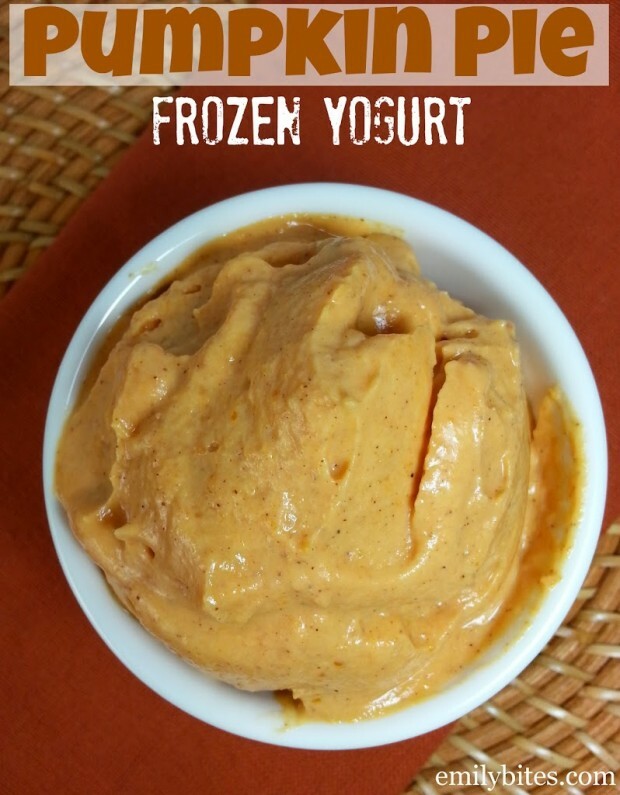 Thank you for the Pumpkin Frozen Yogurt recipe! Can’t wait to try it. This was great! I made it with costco’s fat free plain yogurtt. Because it was plain, I added 2 T extra sugar. The kiddos and self gobbled it up!! Yum!! I just found Yoplait Light in “pumpkin pie” flavor… YUMMY! I bet if someone strained that and used it instead of the greek yogurt it would be AMAZING. I look forward to trying this though, in my Cuisinart! I used my brand new Cuisinart ice cream maker, and mine, too, came out with way too much pumpkin pie spice and rock hard. Trying to soften it, add some cream and save it, because it isn’t edible as it is now. Maybe it is the type of greek yogurt used. OH MY GOD. My parents just gave me their ice cream maker since they weren’t using it. I need to try this recipe! I may even try it with a batch of my own homemade fat free Greek yogurt, with added vanilla and stevia to sweeten it. Mmm. I was so excited to try this recipe the other night and I made it in the afternoon so that it would be ready for me after dinner. Not my favorite I have to say, I felt like it really needed something but I don’t think it was more spices…I’ll keep playing around with it but i’m just afraid to add even more points and it not be worth it anymore. I’m definitely the minority in this review though, so it must be my taste buds 🙂 I appreciate finding your site nonetheless. I did this but made them into little frozen drops, using a zip-lock bag and then later getting creative and using my flower ice cube tray and they are DELICIOUS! Thus our function is appreciated by our mayor associated with Bath with giving permission in order to carry out more tests so that there will not be problems so that it can shaped in to a stunning book which would grow to be obligatory. I’ve borrowed a friends ice-cream maker especially to make this lol! The mixture tastes pretty good so far 🙂 I cut the sugar from mine as my pumpkin (fresh – cooked and mashed) was pretty sweet (home grown) and I only added 1/2 a tsp of the pumpkin pie spice as it tasted pretty strong at 1/2. I’m in Australia and couldn’t find Fat Free Vanilla Greek Yoghurt, so had to go with a low fat one instead, result is, with out the added sugar it will come to 88cals 🙂 yay! You probably need to add more sugar. I made it and thought it needed something, and I think it just needs to be a lot more sweeter. Or maybe some chocolate chips. That’s a fantastic recipe! We can’t wait to try it! Really great recipe, thank you for sharing this!! !